This southwestern kale chickpea salad is packed with goodies (avocado, tortilla chips, corn and garlic chickpeas) and is drizzled in the most delicious Greek yogurt Caesar dressing! Why salads? It is nice not to have to turn on the oven for one thing, and chopping stuff sounds a whole lot easier to me than cooking or sautéing or roasting stuff. So we have been living off of these big old easy salads (and there are more coming your way!!) 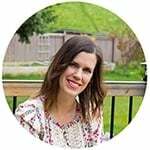 Last month I made this Honey Lime Shrimp Taco Salad, and last week-end I rounded up my favorites from around the web. And now I’m back at it again with this Southwestern Kale Chickpea Salad. And this salad is pretty much a kale caesar salad. With the creamiest Greek yogurt caesar dressing. And a southwestern twist in the form of avocado, tortilla strips and corn. Aaaaaand garlic chickpeas. No shortage of goodies in this salad!!!! So I was going to use my mom’s Caesar dressing recipe but I was honestly a teeny bit freaked out by putting up a recipe with a raw egg yolk for you all, and also, SO MUCH OIL! Now I know why it tastes so good, Mom! So I decided to come up with my own dressing, using Greek yogurt, some mayo, anchovy paste, lemon juice and garlic. You guys are going to love it, not only is it lighter than the regular Caesar dressing, it is SO easy to throw together, and no blender necessary! One note on the garlic chickpeas. They are pan-fried until they take on a whole new delicious texture, but they are not as crispy as oven-roasted chickpeas. Even so, we absolutely loved this pan-fried version! And guess what? 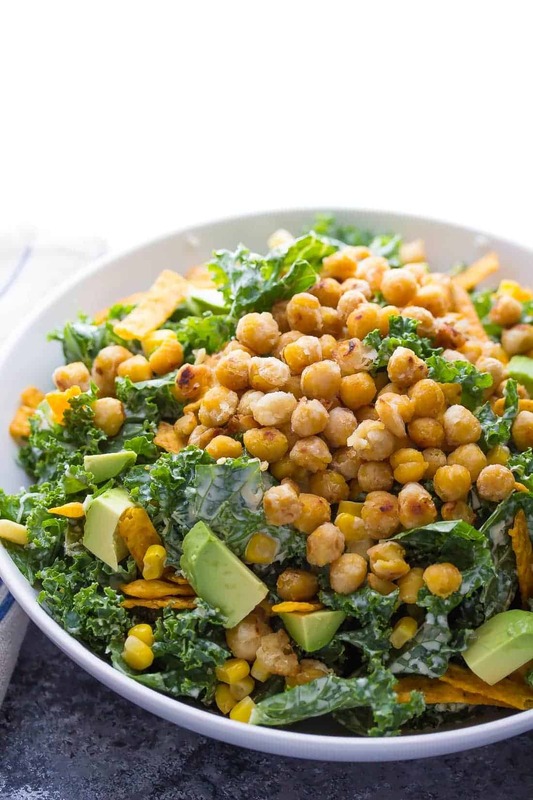 This kale chickpea salad is ready in only 30 minutes…and today is 30 Minute Thursday, which means that you have a whole lotta delicious 30 minute dinner recipes coming at you! Check them all out below! Spread rinsed chickpeas out on a paper towel, blot with another paper towel gently, and allow to sit for 10 minutes. Toss chickpeas in a large bowl with flour and garlic salt to coat. Heat oil in a large pan over medium heat. Add chickpeas and cook for 15-20 minutes, stirring occasionally, until they are golden and slightly crispy. Stir together all ingredients in a large bowl until smooth. Place the kale in the large bowl containing the dressing. Toss to coat, then divide between four bowls. Top with chickpeas, parmesan cheese, corn, avocado and tortilla strips. I love big salads!! Especially when it gets warm out. And I am totally into creamy dressings lately, even though I’m usually not– I blame baby. The kale in our garden is almost done for the year, so I definitely need to try this one ASAP!! I love healthy and filling meal-sized salads! 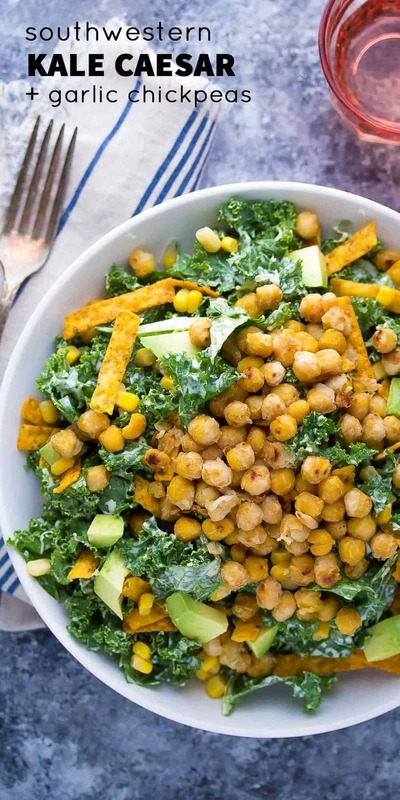 Between the kale, chickpeas, and avocado, I know I’d love this meal! I love big salads, and totally always think of that Seinfeld episode too when I say that! This salad looks amazing, love the lightened up Caesar dressing! I totally remember that episode of Seinfeld! Every time I order a big salad, I think of it. This kale salad looks AMAZING! Love the crispy chickpeas. I will be making this a lot as soon as it is too hot to turn the oven on. Love it Denise! Omg this salad looks so good. I took like 3 photo shoots today and they were all desserts, so this salad sounds amazing! I love that creamy dressing and those chick peas are calling to me. Making this very very soon! Thanks Cyndi! I know kale is a hard sell sometimes, so I made sure to put a lot of goodies in it! Ooooh girl, this is getting made for dinner ASAP. 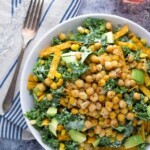 I have been craving freshness like nobody’s business and a kale salad sounds like just what I need, especially with garlic chickpeas. Holy yum. Love your salads!!! This is my kind of salad, Denise – and you know I love salads. I could eat a huge bowl of this – so good! Oh I’m such a Seinfeld nerd. I always think of the “big salad” episode when I’m eating a big salad. Too funny. I could watch the re-runs all day long! This is exactly what I wish I had for lunch right now. I’m starving and you’ve got my salivating! I miss Seinfeld! I used to watch it all the time when I was a kid, and totally didn’t understand any of the jokes. Ha ha! Thanks, Liz! You know what, I was able to grow some purple kale, and it was really tasty! It wasn’t bitter at all and was kind of like spinach or lettuce. I bet you could grow it! I could eat salad every day if it was just like this one! Love the kale and chickpeas in here. And that dressing sounds so yummy! This is very creative. Great recipe, Denise!! Thanks so much Jen! I always need a ton of goodies in my salads, ha ha! 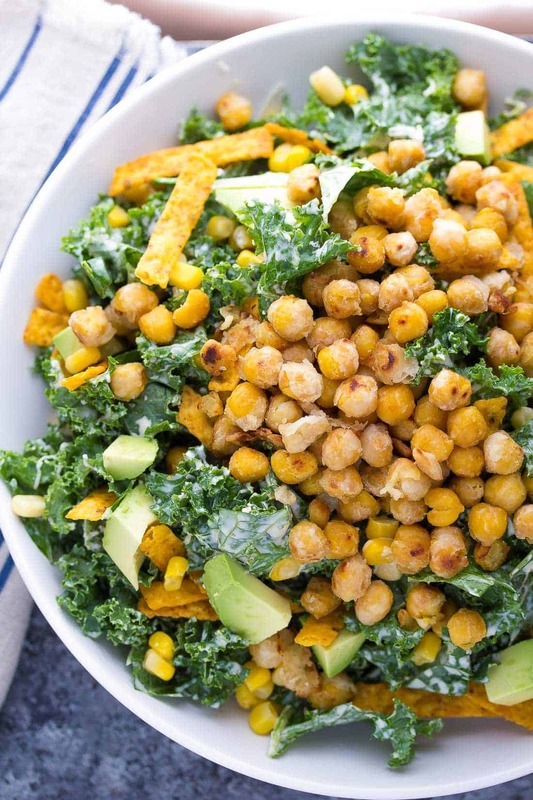 I love kale caesars, and all those chickpeas pile on top look insanely delicious here! The Greek yogurt caesar sounds like the perfect way to lighten this up — this is a salad I need to try! Thanks, Marcie! I feel kind of guilty eating romaine lettuce when I could use spinach or kale in a salad, you know? So many extra nutrients. Big salads are pretty much my favorite…I could eat a salad every day and be happy. This version looks SO good! I love the zesty flavors and chickpeas in here! ME TOO! Ha ha, crazy salad addict here. Thanks, Gayle!